நின்னலாலிலேன் காண் என்னை நீ குறிக்கொள்ளே. சுவாமி நம்மாழ்வாரின் அமிழ்த்தாய் இனிக்கும் வரிகள் :கரும்பின் சாறு போன்றவனே! ; அமிருதம் போன்ற அதிமதுரமான காளமேகத்திருவுருவனே; எனக்கு நித்யானுபவத்திற்கு உரிய கண்ணபிரானே! ~ உன்னையன்றி வேறொருவரைத் தஞ்சமாக அடைய மாட்டாத அடியேனை நீயே திருவுள்ளத்தில் கொண்டருளவேணும். 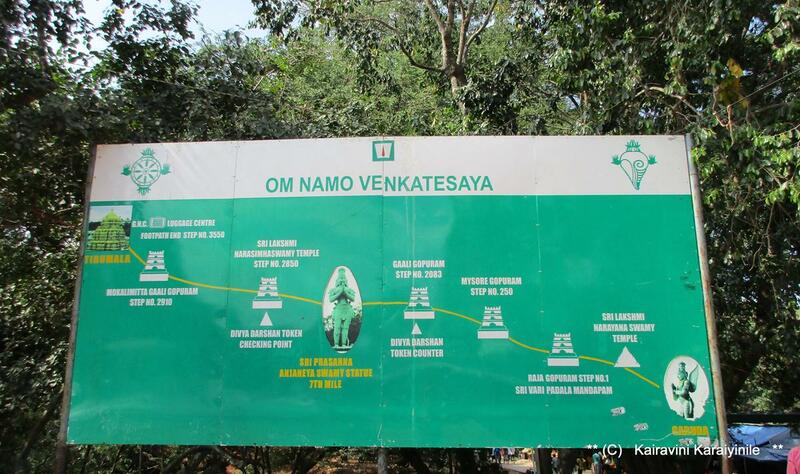 After conquering Lanka slaying Ravana, and after Rama Pattabishekam is born the twins Lava and Kuch in sage Valmiki’s ashram. 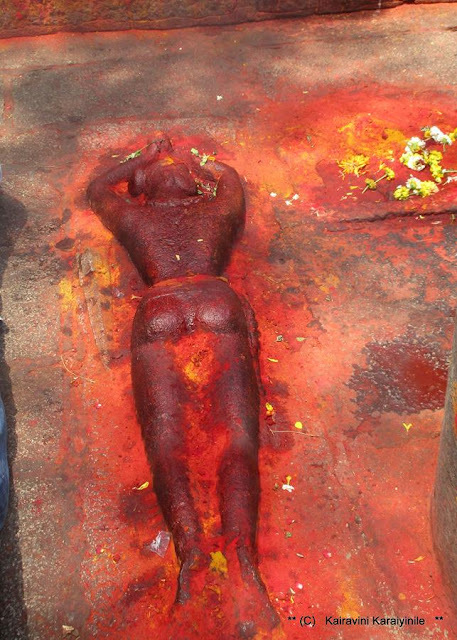 Rama performed an Ashwameda Yaga in Ayodhya. 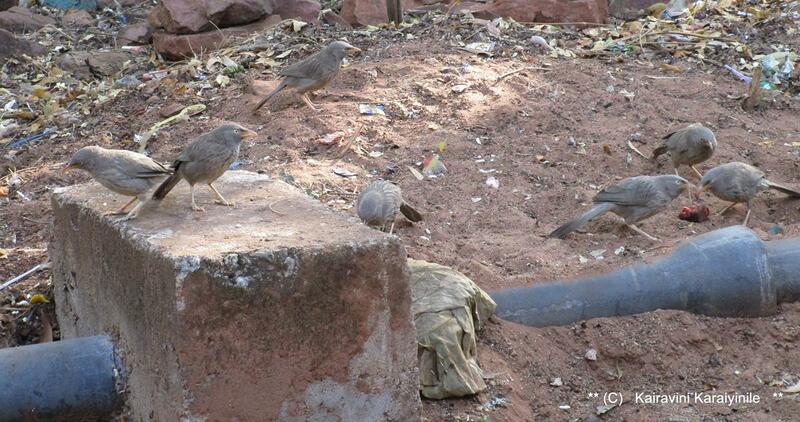 The horse of the Ashwamedha Yaga came to the place where Lava Kucha brothers were living. Lava and Kucha caught the horse and bound it. In early 1980s, there were not many buildings on the Poonamallee High Road, Arumbakkam Open Terminus would look a desolate place on the road with couple of drums having water for buses ~ not much traffic too. One thought that it was the city outer. Life has changed ! more so for Koyambeu, which is believed to be Kucha Lava Puri. 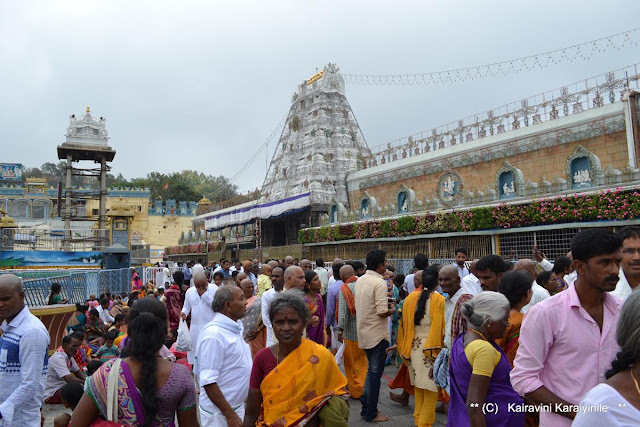 The modern day Koyambedu is a major hub of activity in Chennai City after the inauguration of the Koyambedu market for fruits and vegetables. After the market getting shifted from local Kothawalchavadi, was established Koyambedu Wholesale Market Complex (KWMC), in 1996; a couple of years back, construction of an exclusive foodgrains market, the first such facility in the state, began. 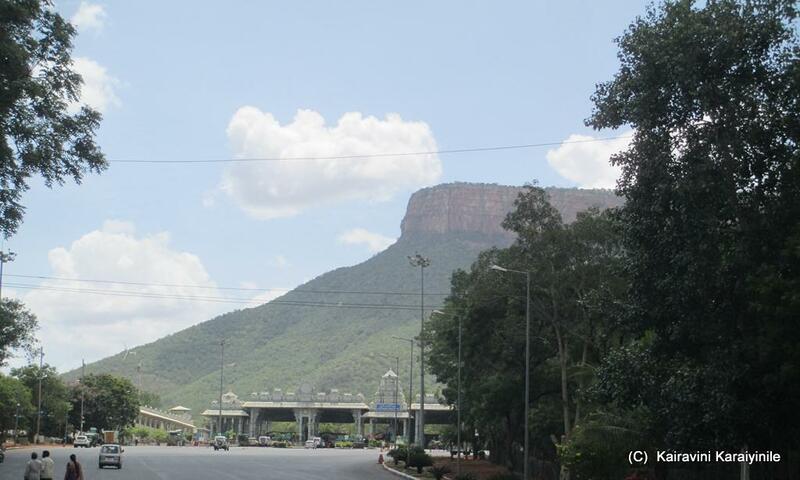 Then there is the CMBT the mofussil bus terminus from where hundreds of State transport and private buses operate. Another added facility is the recent – Metro Rail station. 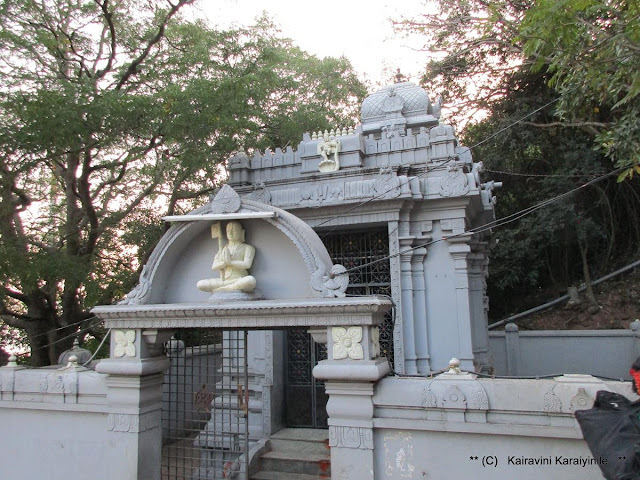 Kuchalalavapuram to Koyambedu – also believed that the names of this place in ancient days were as Kosai Nagar, Koyattipuram and Prayachithapuram. 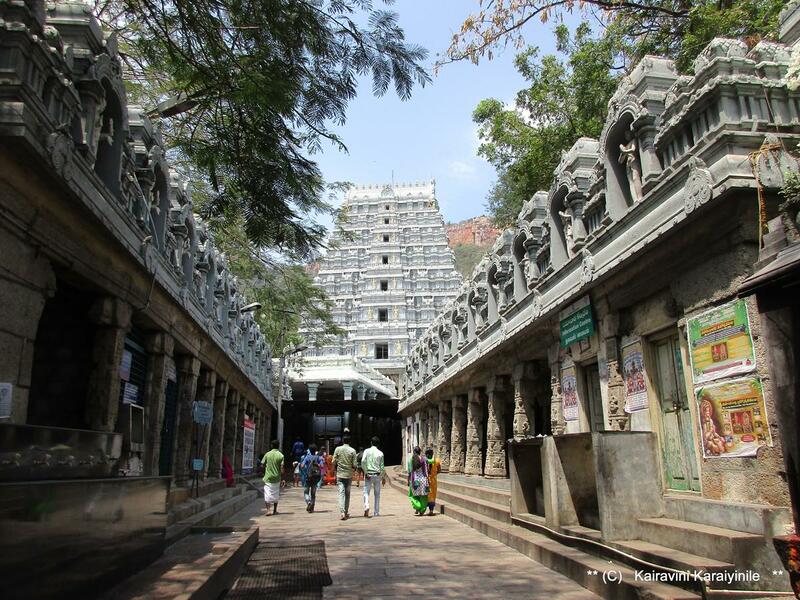 Kulothunga Chozha is said to have ruled in the 12th Century and hence it is said that the temples of Lord Kurungaleeswarar and Sri Vaikundavasa Perumal were constructed during his period. Today had darshan at the century old Sri Vaikundavasa Perumal temple at Koyambedu. 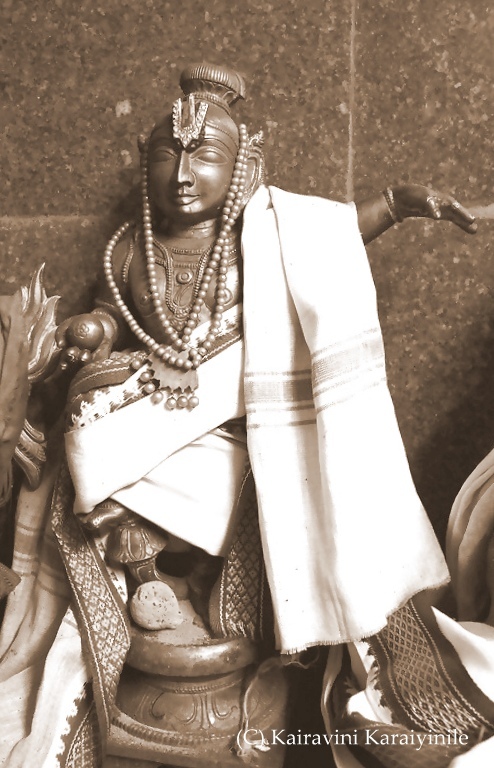 The moolavar here Vaikunda Nathar is in standing posture [in most places it would be in sitting posture] as appeared to Sage Valmiki. The Uthsavar is the beautiful Bakthavatsalar almost like our Thelliya Singar of Thiruvallikkeni with ‘abaya aahvana hasthams’. Thayar is Kanakavalli thayar. 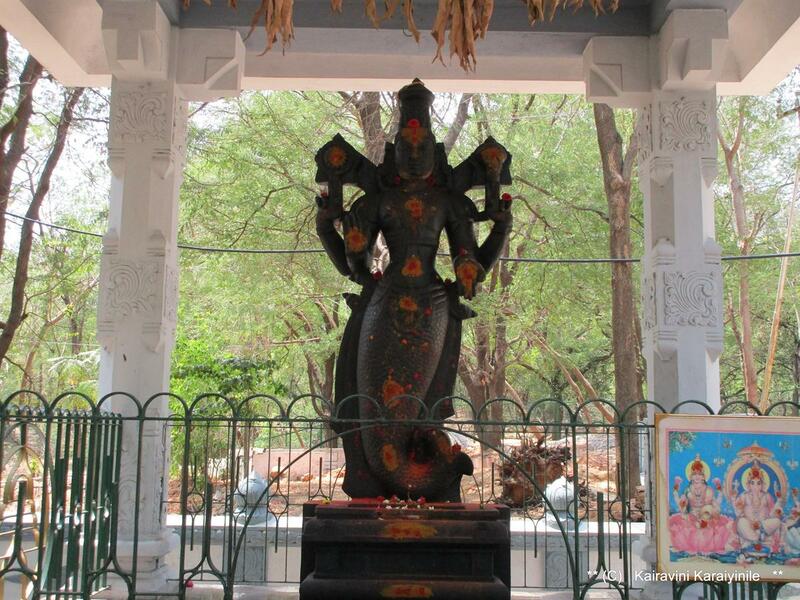 In the main sannathi, there is vigraham of Sri Vaikanasar also. Then there is the most beautiful Sri Rama with Sita devi. In every other sthalam, where we have darshan of Sri Rama, He will be with Sita, Lakshmana, and Aanjaneya. There are other places where Baratha, Satrugna are also there; in some in Pattabisheka thirukolam. Here uniquely it is only Lord Rama and Sita devi, in the most beautiful form. Here are some photos of the Temple and of Lord Sri Rama and Sita devi. Today 14th Aug 2017 is a day of great significance, for we Celebrate the ‘Birth of Bhagwan Sri Krishna’. Ithihasa Puranas are the fundamentals to tenets of Vaishnava philosophy and one can learn everything in Sri Ramayana and Mahabaratha. 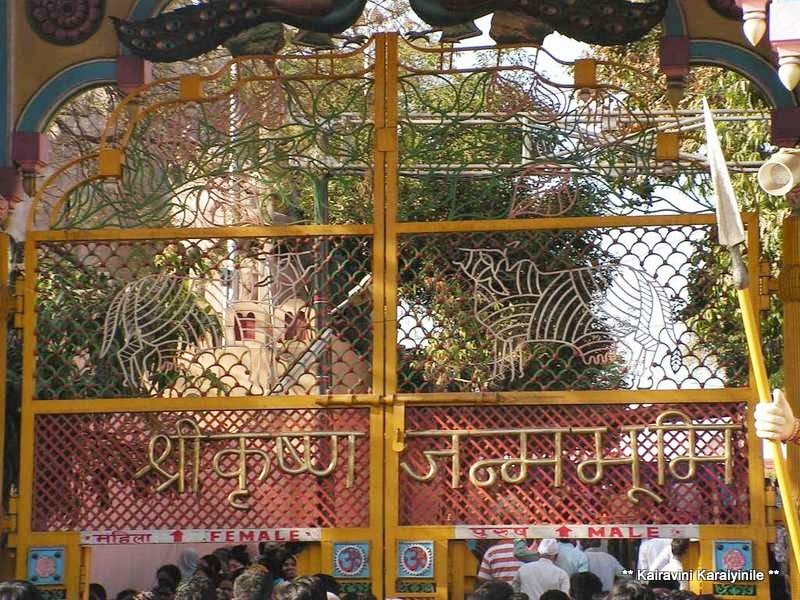 The birth of Lord Sri Krishna at Mathura to Vasudeva and Devaki is celebrated with gaiety everywhere. While some celebrate the coming of Lord Krishna to this Universe on Ashtami day as ‘Gokulashtami’ – in South India, it is more with the star of ‘Rohini’ and the birth day is being celebrated as : Krishna Jayanthi, Janmashtami, Gokulaashtami, Sri Jayanthi and more – all various names celebrating the birth of Bhagwan Lord Sri Krishna in this Universe on the Ashtami (8th day of dark half of Krishna paksha) on the Rohini Nakshathiram. This year, Srijayanthi will be celebrated grandly at Thiruvallikkeni and other divyadesams on Wednesday, Sept. 13, 2017. 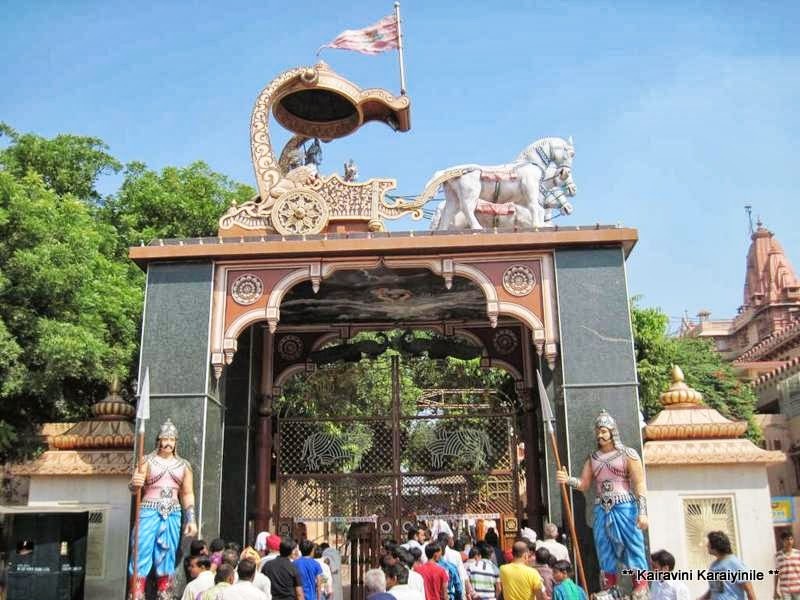 Krishna was born is under a doom – all heavily fortified and guarded these days. 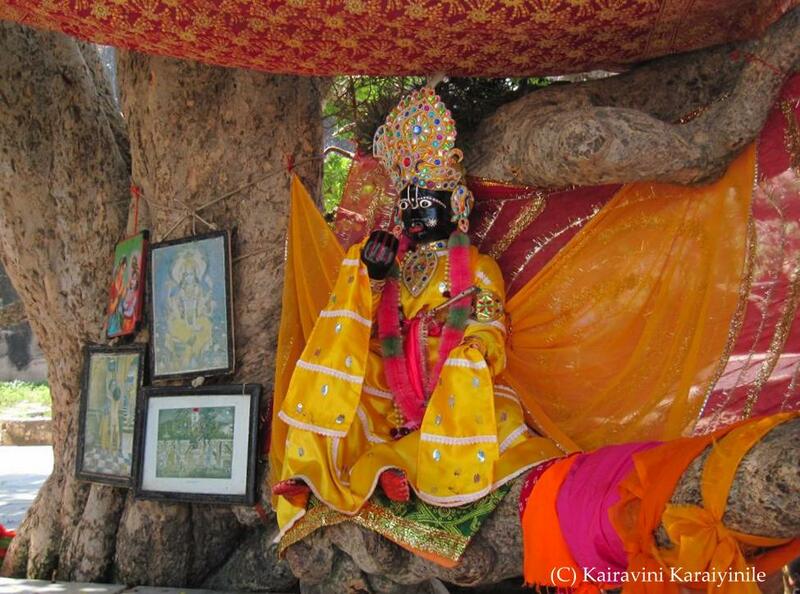 At the Janmasthan is the most beautiful Kehsav Dev(Krishna), the worshipped deity of this temple. According to traditions the original deity was installed by the great-grandson of Krishna. Here is something on ‘Mathura’ as recorded in British history – which states that a few centuries ago, the District was widely the two tracts differing in character. 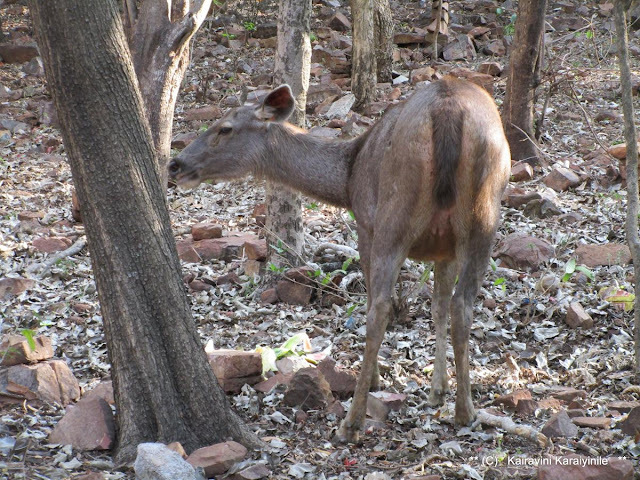 Varaha Mihira, writing in the latter half of the fifth century to speak of Mathura as consisting at that time also of two very dissimilar portions. For, in the 16th section of the Brihat Sanhita, he includes its eastern half, with all river lands (such as is the Doab), the western half, with the Bharatas and Purohits and other managers of religious ceremonies. The Chinese pilgrim, Hwen Thsang, describes the circumference of the kingdom of Mathura as 5,000 li, i. e., 950 miles, taking the Chinese li as not quite one-fifth of an English mile. The people, he says, are of a soft and easy nature and delight to perform meritorious works with a view to a future life. The soil is rich and fertile and specially adapted to the cultivaiion of grain. He mentions of Cotton stuffs of fine texture; obtainable gold ; while the mango trees are so abundant that they form complete forests. Apart from inscriptions and other fragmentary archseological vestiges of its ancient glory, the first authentic contemporary record of Mathura that we find in existing literature is dated the year 1017 A.D., when it was sacked by Mahmud of Ghazni in his ninth invasion of India. The original source of information recording Mahmud’s campaigns is the Tarikh Yamini of A1 Utbi, who was himself secretary to the Sultan, though he did not accompany him in his expeditions. 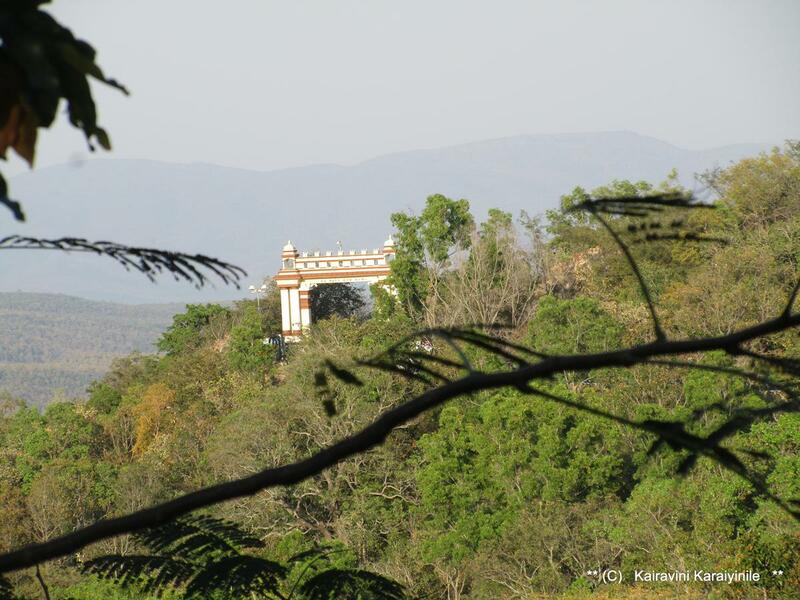 The place supposed to be Maha-ban he calls the Fort of Kulchand,” a Raja, who (he writes) “ was, not without good reason, confident in his strength, for no one had fought against him and not been defeated. He had vast territories, enormous wealth, a numerous and brave army, huge elephants, and strong forts that no enemy had been able to reduce. When he saw that the Sultan advanced against him, he drew up his army and elephants ready for action. But finding every attempt to repulse the invaders fail, the beleaguered infidels at last quitted the fort and tried to cross the broad river which flowed in its rear. When some 50,000 men had been killed or drowned, Kulchand took a dagger, with which he first slew his wife and then drove it into his own body. In the neighbouring holy city, identified as Mathura, he saw a building of exquisite structure, which the inhabitants declared to be the handiwork not of men but of Genii. The town wall was constructed of solid stone, and had opening on to the river two gates, raised on high and massive basements to protect them from the floods. On the two sides of the city were thousands of houses with idol temples attached, all of masonry and strengthened with bars of iron ; and opposite them were other buildings supported on stout wooden pillars. In the middle of the city was a temple, larger and finer than the rest, to which neither painting nor description. The Sultan thus wrote respecting it:— If any one wished to construct a building equal to it, he would not be able to do so without expending a hundred million dinars, and the work would occupy two hundred years, even though the most able and experienced workmen were employed.’ Orders were given that all the temples should be burnt with naphtha and fire and levelled with the ground.” The city was given up to plunder for twenty days. Among the spoils are said to have been five great idols of pure gold with eyes of rubies and adornments of other precious stones, together with a vast number of smaller silver images, which, when broken up, formed a load for more than a hundred camels. 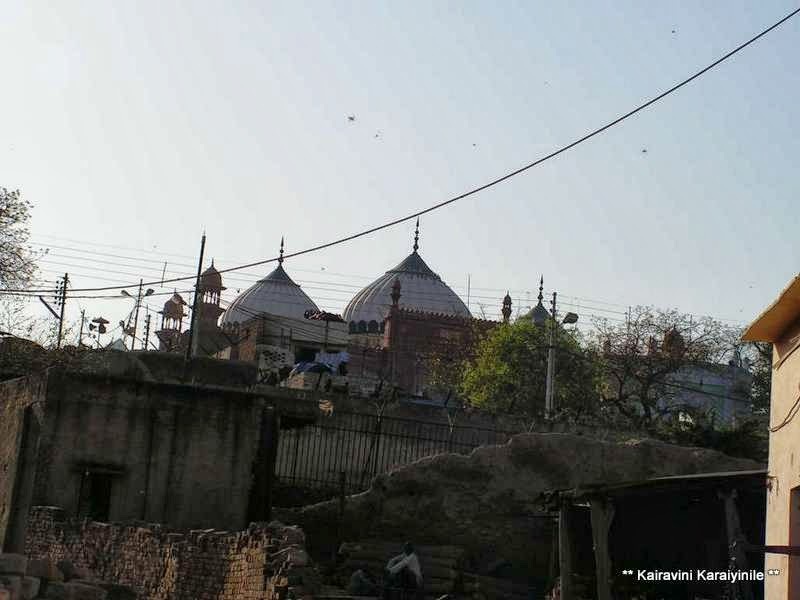 The total value of the spoil has been estimated at three millions of rupees ; wliile the number of Hindus carried away into captivity exceeded 5,000. 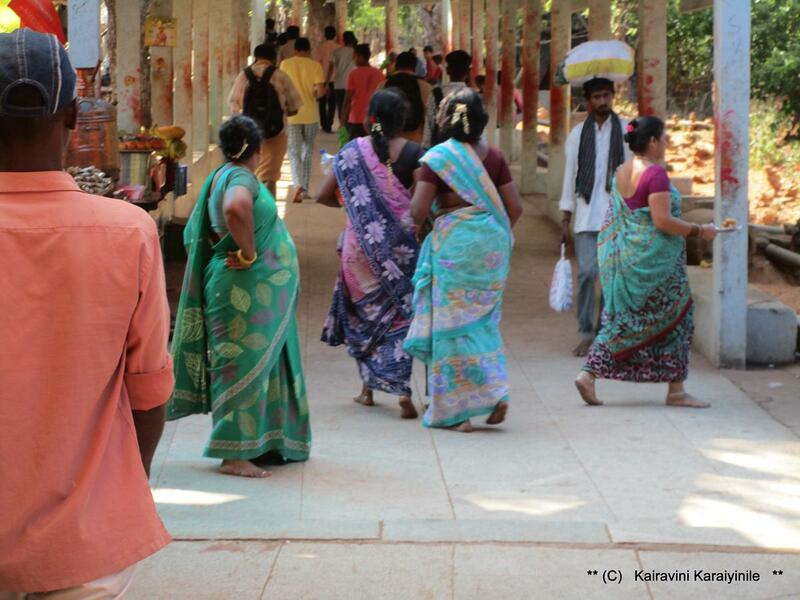 For a Srivaishnavaite - visiting Divyadesams and having darshan of Emperumans in these places are of utmost importance. 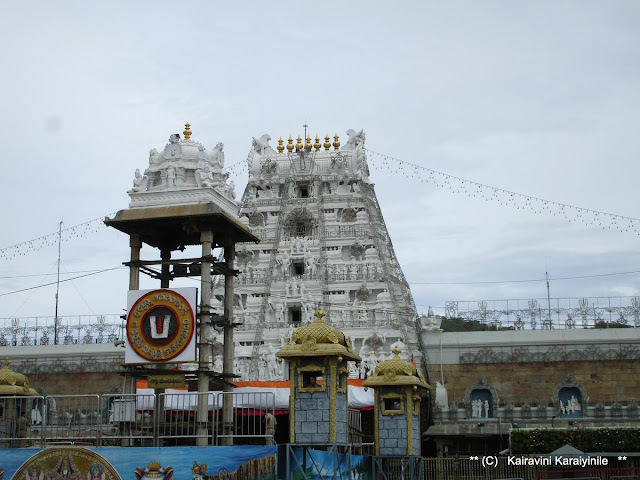 When we utter – “Kovil, Thirumalai, Perumal Kovil “- reference is to “Thiruvarangam, Thirumala Tirupathi and Kanchipuram”respectively. 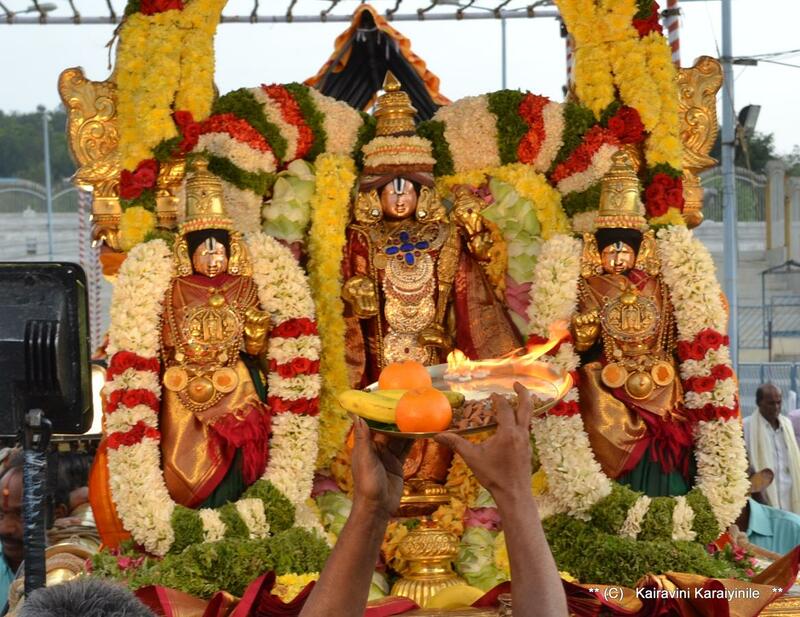 “Adi vo Alladi Vo Sri Hari Vasamu…. 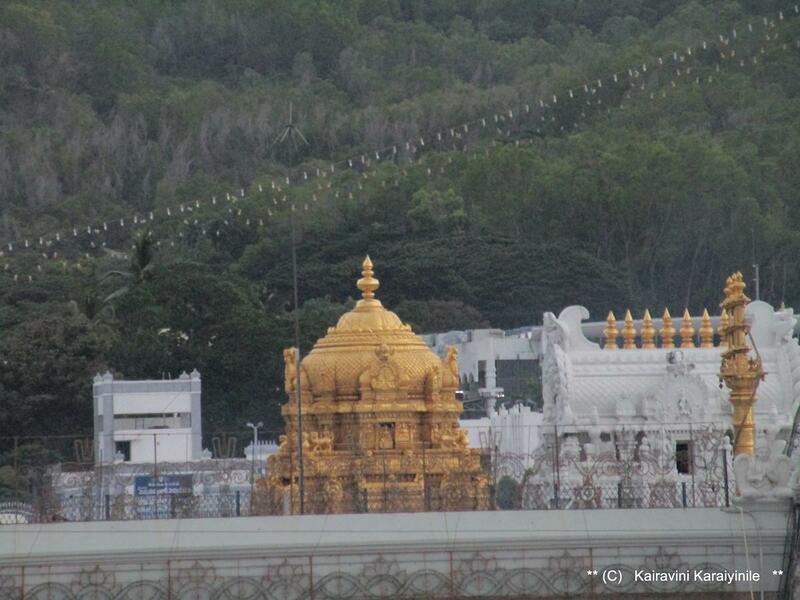 Padi Velu Seshula Padagala Mayamu” … Look and behold, this is abode of Hari- the place where He resides, formed by the hood of Adisesha; place where sages dwell uttering His name all the time; the place replete with riches and prosperity, the Holiest of all places …. 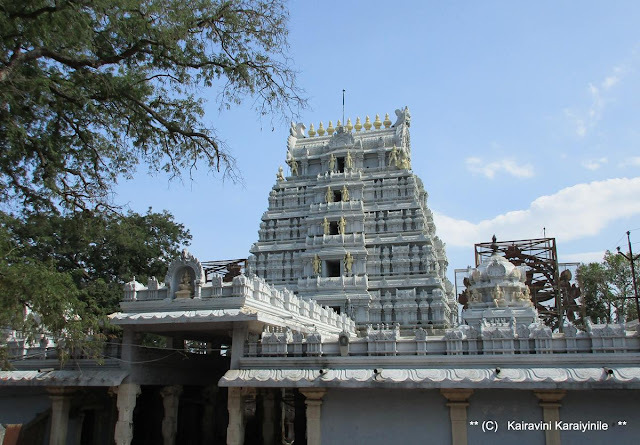 sang Tallapaka Annamacharya [popularly Annamayya], the 15th century musician who composed keerthanas on Lord Venkateswara. 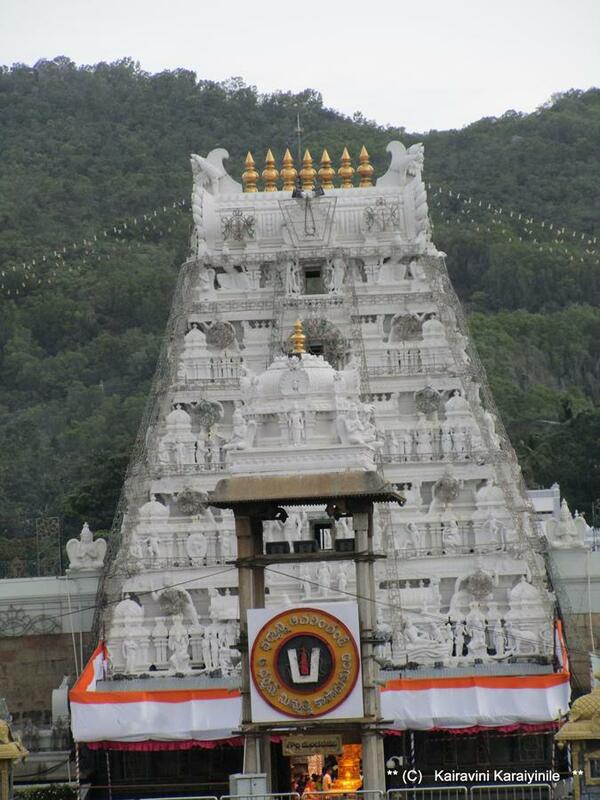 The sacred Thirumala, the abode of Lord Venkataramana, [Balaji, Govinda, Ezhumalaiyan….] starts with Alipiri, the place at foothill of seven hills in Tirupathi, from where pilgrims starts ascending the Holy Thirumala. Alipiri literally would mean resting place. In olden days pilgrims used to climb all the seven hills only through the stepped way on foot, as there was no other option. 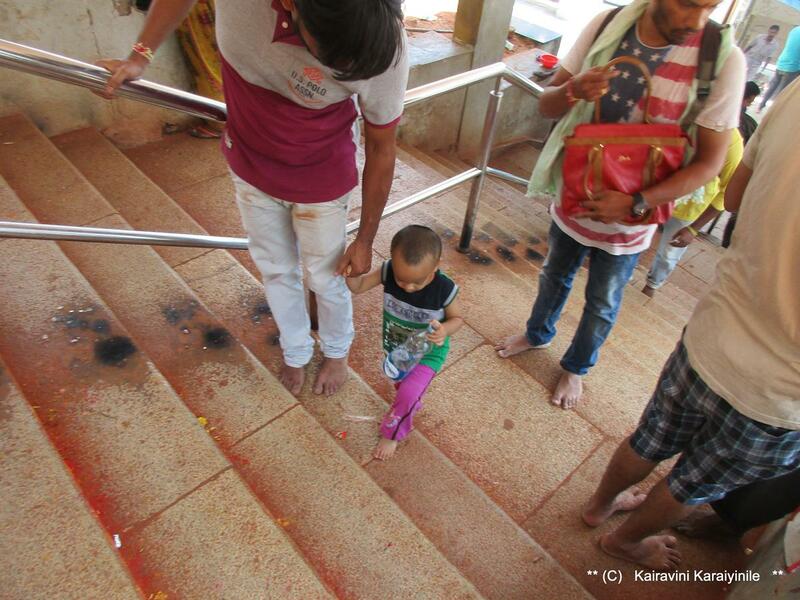 The pilgrims coming from long distances used to take rest for some time at the starting place **Alipiri** [adivaram in Tamil] cooked their food, eat, hailed the benevolence of the Lord and after rest, with sacredness imbued in their hearts, started climbing the steps. Times have changed – presently there are lots of facilities in the hill; [the commitment and bakthi of pilgrims is ever on the increase] the roads are very well laid. The transportation is at its best as there are buses at almost every 5 minutes from the foothill to the top – the abode of Lord. Private vehicles too are allowed ~and there are so many new cars, motor cycles, jeeps and other vehicles. In olden days, people used to climb the hill afoot which was arduous. 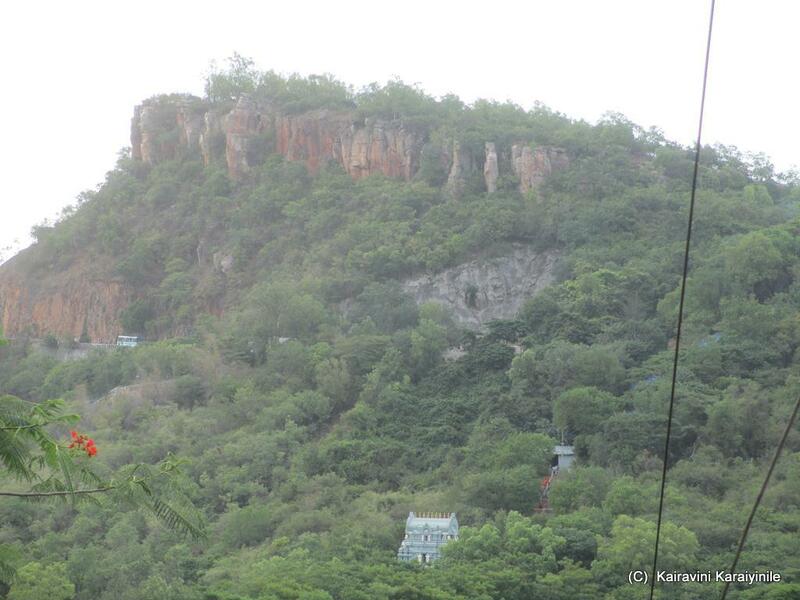 Sri Udayavar (Ramanujacharya) used to climb the hill on his knees reverring the sacredness of the hill itself. The starting point Alipiri is around 5 km from the Railway Station / Bus stand and the temple of Sri Govindarajar at Tirupathi. The Seven hills have thick vegetation and some animals too. 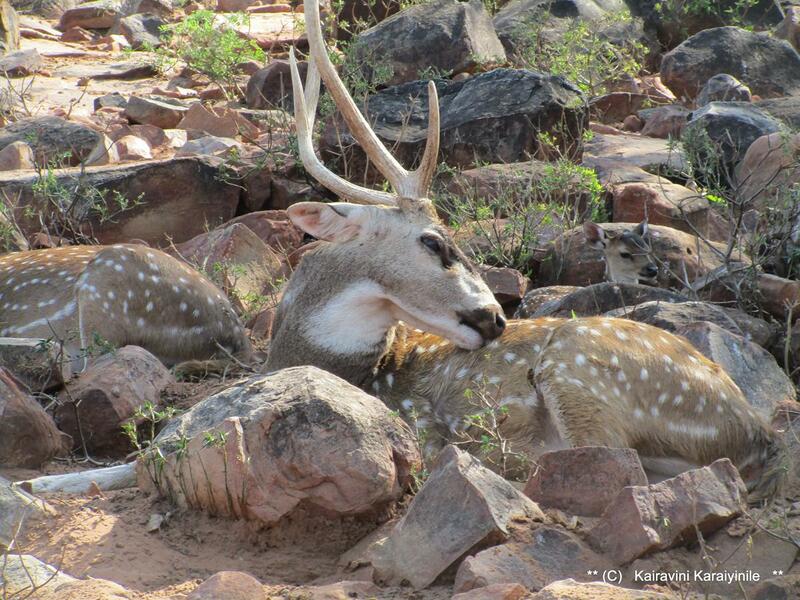 Once in a while some wild animals are spotted. 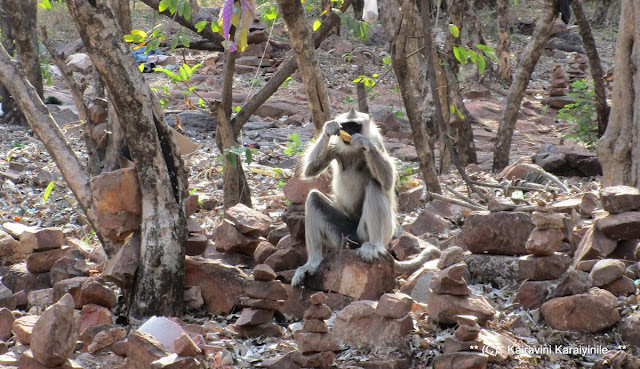 A few decades ago, there were lot of monkeys abounding the holy hills – [I thought them to be common bonnet macaque; they were caught and taken out of Thirumala; this time I spotted some, which looked like Gray langurs or Hanuman langurs, more hostile than the macaque !]…….. 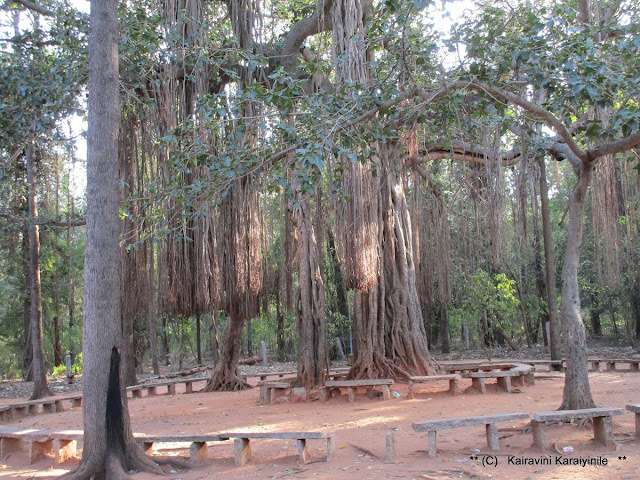 What was thick vegetation and foothill of a forest has in the recent decade been converted– to a spacious hub where vehicles and persons undergo ‘security check-up’. 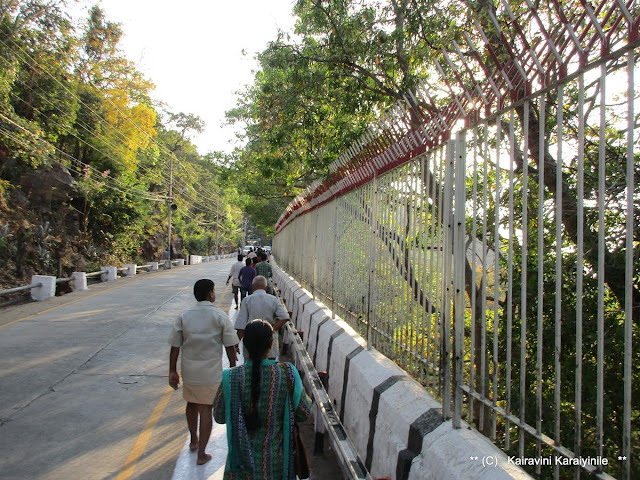 The transformation at this place in someways owes to that ghastly incident in Oct 2003, when the then CM of Andhra Pradesh N. Chandrababu Naidu, survived an attempt on his life when suspected People's War naxalites exploded improvised claymore mines targeting his motorcade on the Tirumala ghat road. Mr Naidu suffered some injuries – the impact of the blast was so severe that the bullet-proof car was hurled in the air. A major bloodshed was averted because the car could absorb the impact of the powerful blast.……. 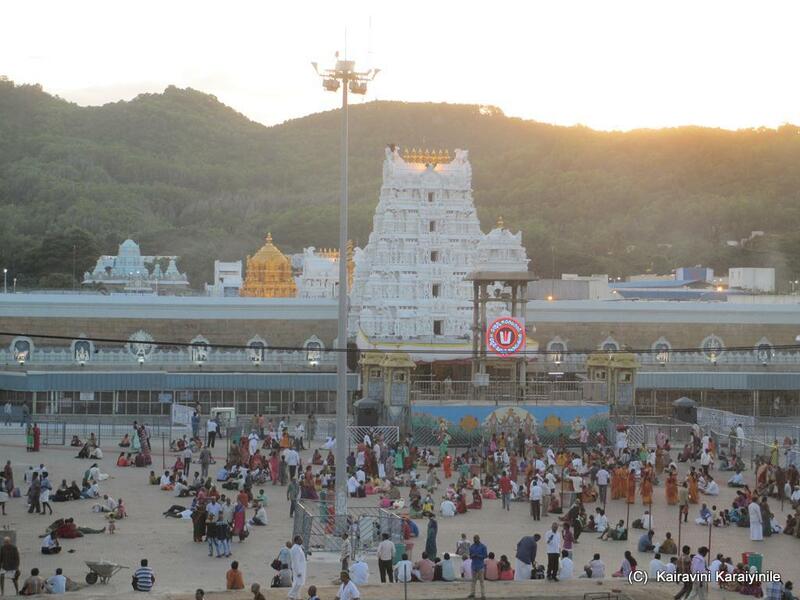 Years later a Tirupati court on Thursday sentenced three persons -- accused in the Alipiri blast case to undergo rigorous imprisonment for four years and to pay fine of Rs. 5,000 each. Of the 33 accused in the case registered in Alipiri police station in 2003, 11 died during trial and 15 were still at large. 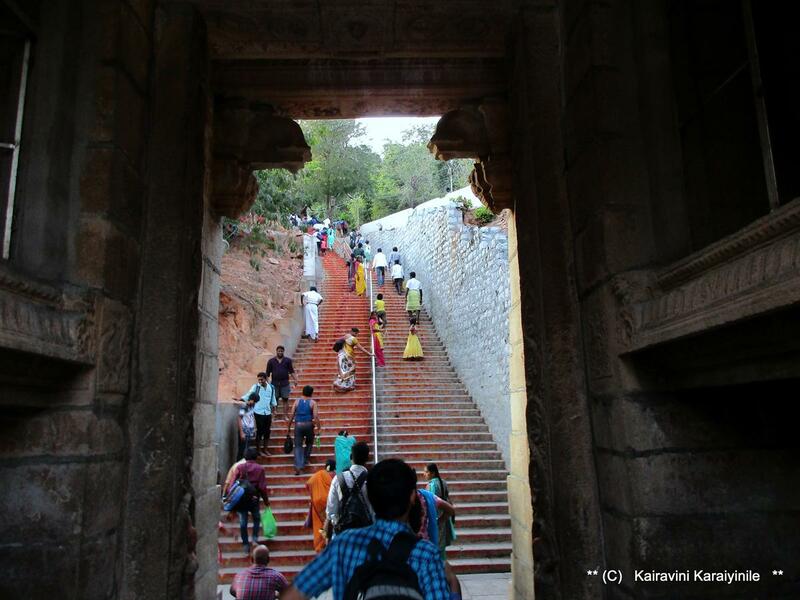 There are now 3550 steps [a distance of around 11 – 12 km] and for a healthy person would take around 4 to 4.5 hours to climb the hill. The footsteps in most places are well covered and there are shops along the way selling beverages, fruits, biscuits and the like. 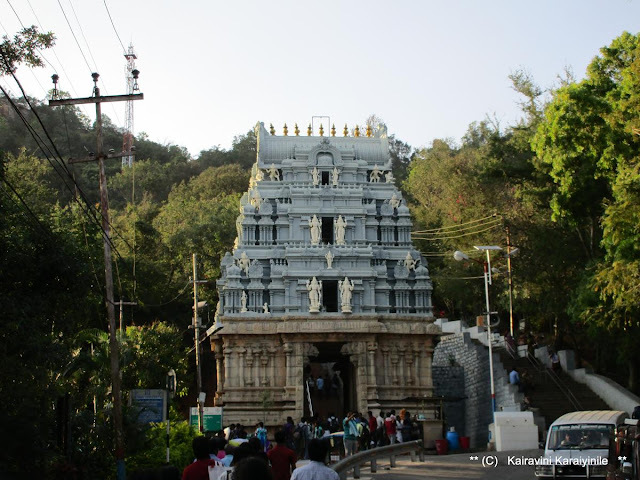 Tirumala Temple Devasthanam [TTD] has made elaborate arrangements including care of the luggage of the devotees who ascend the hill on foot. 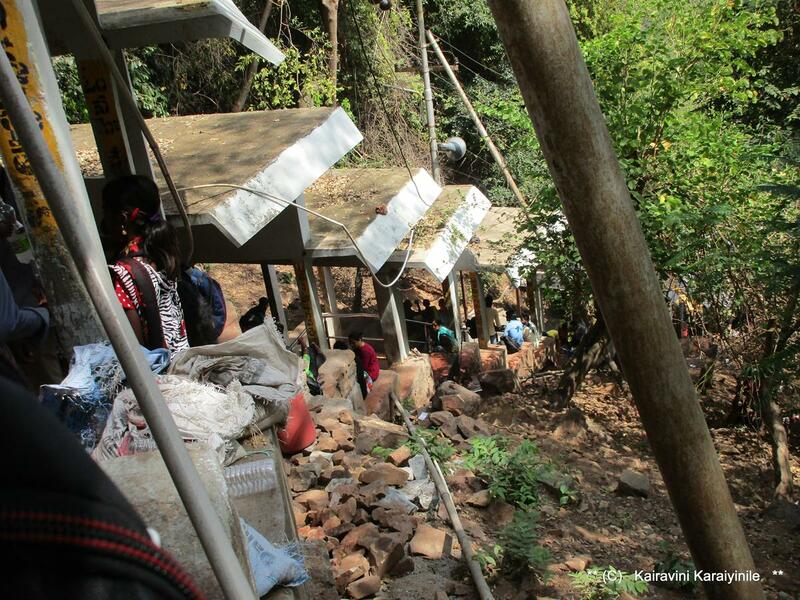 The baggage deposited at Alipiri is carried free of cost and can be collected at the top. The bags should have a lock is a pre-requisite. They also issue tokens facilitating special darshan for the pilgrims, which is revalidated at another point. On the way stands a deer park housing hundreds of deers, which attracts people. At every point enroute, you can see thousands of people climbing the hill by foot – the pilgrims include children, youth, old people and those with some disabilities – all with full faith on Lord Srinivasa, climbing happily singing paeans in praise of the Lord and speaking of the greatness of the Lord. 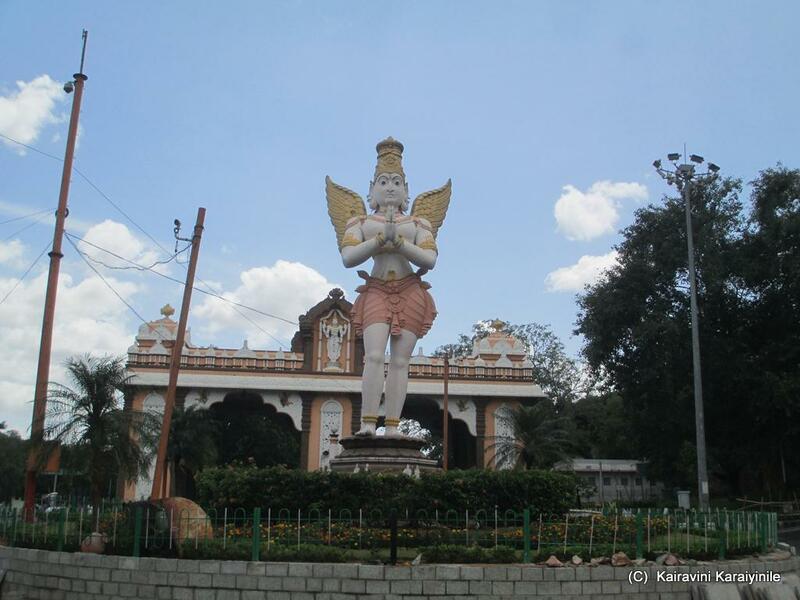 At the starting point, a huge statute of Garuda azhwar stands. 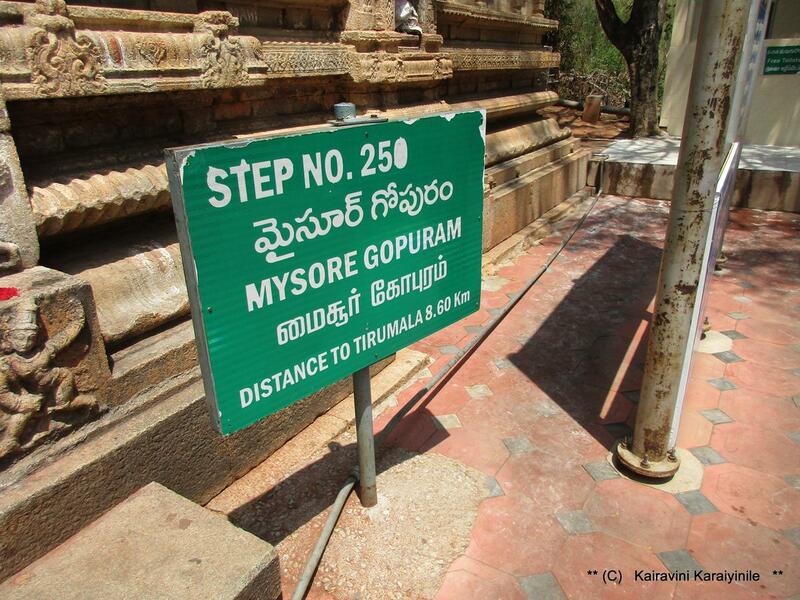 There is Raja gopuram, Mysore gopuram, Gali gopuram, tall statute of Prasanna Aanjaneya, steep steps known as Mokali mitta (literally breaker of knees). On the way, TTD has installed statues describing the Dasavatharam – 10 avatars of Lord as also that of Azhwars who have sung about the divyasthalam. Near the Mokali mitta stands a temple of our Ramanuja charya. 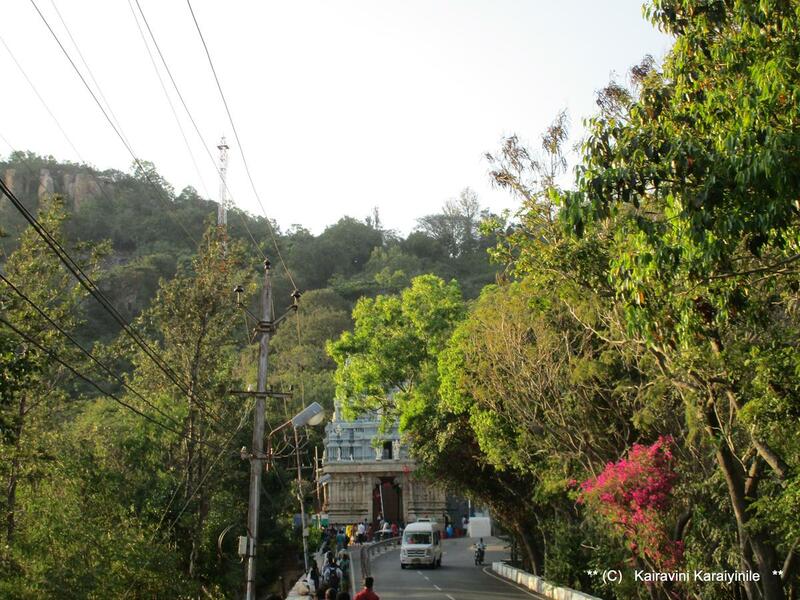 It is a holy place for all ~ as it was here our Jagadacharya Udayavar took rest when he was climbing the hill on his knees. Here are some photos taken recently when I had the great fortune of climbing the divine hill by foot. In fact there is another path too – besides Alipiri, there is another known as Srivari Mettu, nearer Srinivasa Mangapuram in Chandragiri mandal. It is believed that Srivarimettu is much older pedestrian path, believed to have been used by legendary emperor Sri Krishna devaraya in 16th century. This path stands revived in a decade or so. 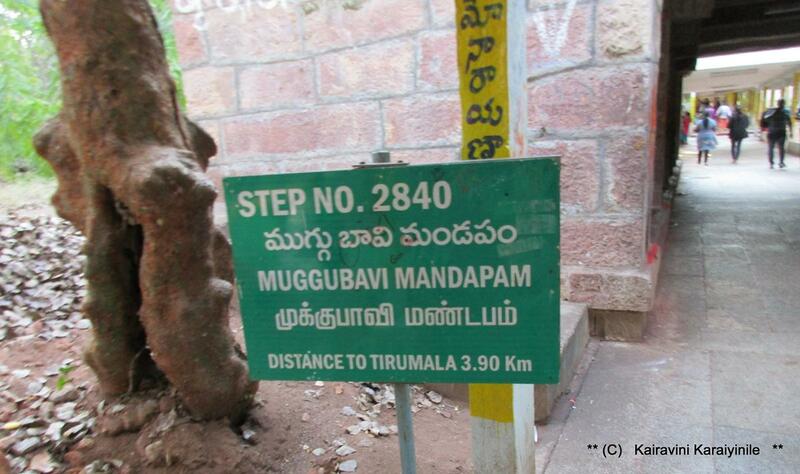 This reportedly is shorter route and Thirumala can be reached in less than 3 hours. The facilities on this route are perhaps less and there are time restrictions in using this path. 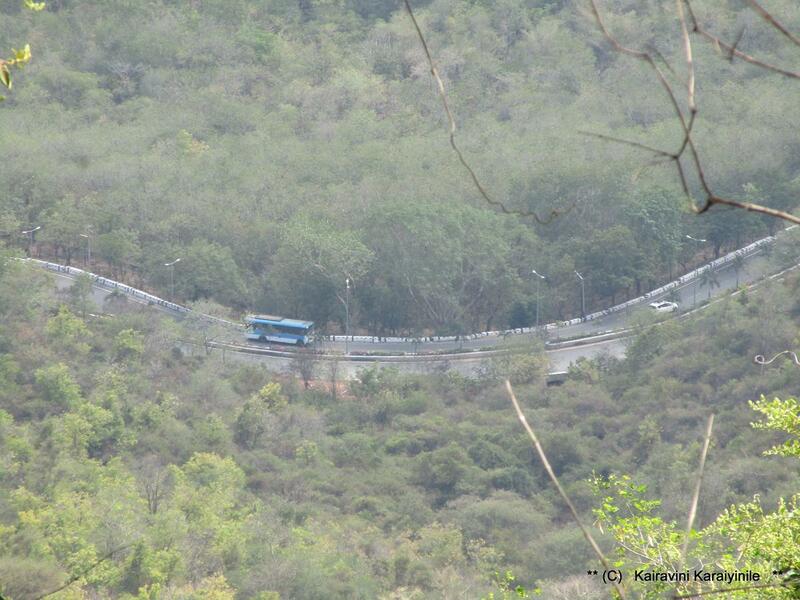 While there are frequent free buses of TTD to Alipiri, it much less to Srivarimettu, which passes through dense forest that has some animals. 'கலியுகத்தில் கண் கண்ட தெய்வமான திருவேங்கடமுடையானின் திவ்யதேசம், அருள்கள் அனைத்தையும் தரும் சிறந்த இடமாய் திகழ்கிறது. மழையோ, வெயிலோ, குளிரோ பாராமல் இங்கே குவியும் பக்தகோடிகள் எம்பெருமானின் சில வினாடி தர்சனம் பெற ஓடோடி வருகிறார்கள். திருப்பதி என்பது மலைக்கு கீழே உள்ள பகுதியையும் திருமலா என்பது திவ்யமான திருமலையையும் குறிப்பதாக கொள்ளலாம். 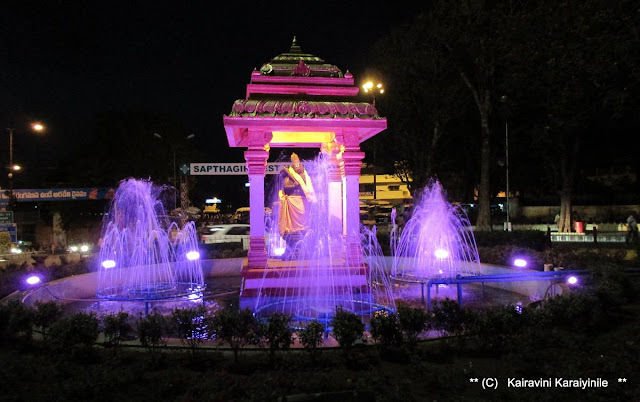 இந்த திவ்ய தேசம் ஏழு மலைகளுக்கு நடுவே சிறப்புற மிளிர்கிறது. “சென்றுசேர் திருவேங்கட மாமலை, ஒன்றுமே தொழ நம் வினை ஒயுமே! : - திருவேங்கடவனை காண திருமலை நடந்து ஏறி சென்று தரிசனம் செய்தல் மிக புண்ணியம். சுமார் ஐம்பது வருடங்கள் முன்பு கூட திருமலைக்கு செல்வது சற்று கடினமானதாகவே இருந்து வந்தது. அந்நாட்களில் பஸ் வசதி குறைவு. 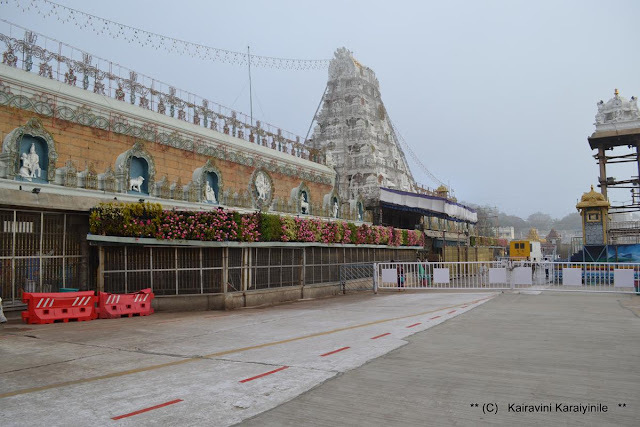 மேலும் ஏறிச் செல்வதற்கும் இறங்குவதற்கும் ஒரே வழிதான். இன்றைய நிலைமை வேறு. 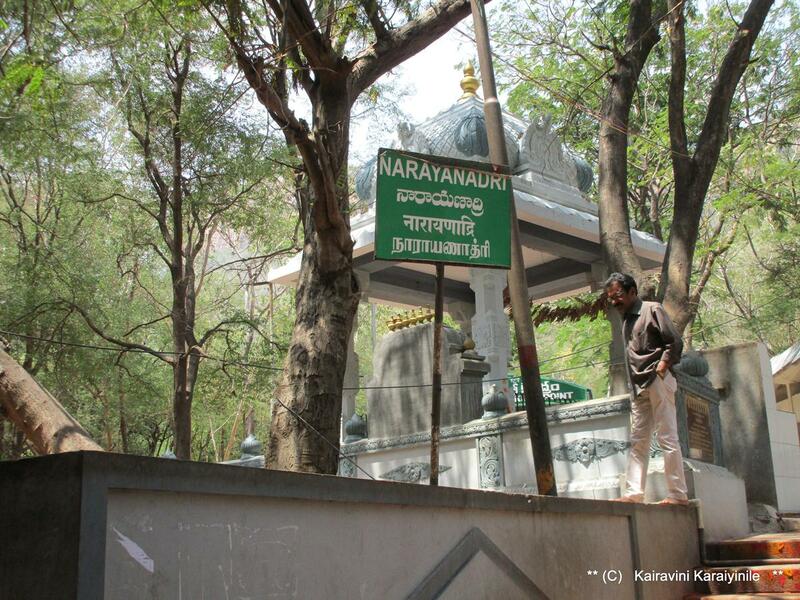 மிக எளிதாக பல வாகனங்கள் செல்கின்றன. சில வருடங்கள் முன்பு வரை, திருமலையில், கோவில் அருகே பல மடங்களும் தங்கும் விடுதிகளும் இருந்தன. இப்போது அவை அங்கு இருந்த தடயம் கூட இல்லை. இந்த நூற்றாண்டு ஆரம்பத்தில் கூட ஒரு தடவை, நாங்கள் கோவில் வாசல் மிக அருகே கற்பூரம் ஏற்றும் ஸ்தம்பம் முன்பு இருந்த விடுதில் தங்கி உள்ளோம். அப்போது மேடாக இருந்த இடமெல்லாம் கூட துடைத்தாற்போல் கட்டிடங்கள் இருந்த சுவடே இல்லமால் மாறி உள்ளன. திருமலை அவ்வளவு இயற்கை அழகும், வளமும் கொண்ட ஒரு அற்புத பிரதேசம். அடர்த்தியான வனம் - அங்குள்ள மரங்களும், மலை அமைப்பும், ஆங்கங்கே சல சலவென பிரவகிக்கும் அருவிகளும் ரம்மியமானவை. முன்பு மிக கடினமாக இருந்த மலைபாதை இப்போது சுலபமாக பல வசதிகளுடன் அமைக்கப்பட்டுள்ளது. அலிபிரி எனும் மலை அடிவாரத்தில் கருடாழ்வார் பிரம்மாண்டமாய் நிற்கும் இடத்தில் இருந்து திருமலையை அடைய சுமார் 3550 படிகள் ஏற வேண்டும். பலவிதமான பக்தர்கள் - வெவ்வேறு ஊர்களில் இருந்து வருபவர்கள், குழந்தைகள் முதல் முதியோர் வரை பல பிராயத்தினர் வேங்கடவனை காண வேண்டி நடந்து வருகின்றனர். சாதரணமாக நான்கு முதல் ஐந்து மணி நேரங்களில் மலை ஏற இயலும். - ஆழ்ந்த பக்தியும், அசைக்கமுடியாத நம்பிக்கையும், அவனை அடைவதில் அளப்பில்லா ஆர்வமும் கொப்பளிக்க பக்தர்கள் பாடிக்கொண்டும், அவனது அற்புதங்களை பேசிக்கொண்டும் திருமலை ஏறுகின்றனர். அலிபிரி அருகே தேவஸ்தானம் அலுவலகம் உள்ளது. இங்கே பக்தர்கள் தங்கள் இடம் உள்ள மூட்டைகளை ஒப்படைத்து விட்டு கஷ்டமில்லாமல் மலை ஏறலாம். பல ஊர்களில் இருந்து பன்மொழி பேசுவோர் மலை ஏறுகின்றனர். திருவேங்கடவனின் பாடல்களைப் பாடிக்கொண்டும், தீதில் சீர் திருவேங்கடத்தானின் திருவிளயாடல் புராணங்களை சொல்லிக் கொண்டும் அவனை மட்டுமே நினைத்து, அவன் புகழ் பாடி அவனருள் வேண்டி நெஞ்சுருக ஆயிரக்கணக்கானோர் மலை ஏறுகின்றனர். **பண்டெல்லாம் வேங்கடம்** என ஆழ்வார் பாடிய இத்திருக்கோவில் ஏறும் வழியில் சரித்திர நிகழ்வுகளும், அவற்றை விளக்கும் பெயர் பலகைகளும் உள்ளன. ஏறும் வழியில் - கருடாழ்வார், ராஜ கோபுரம், மைசூர் கோபுரம், காலி கோபுரம், விஸ்வரூப பிரசன்ன ஆஞ்சநேயர், விஷ்ணு பாதம், முழங்கால் முறிச்சான் என பல இடங்கள் உள்ளன. அழகான மான்கள் பூங்கா உள்ளது. குரங்கு, காட்டு அணில், மயில், பல விதமான விலங்குகள் காணும் வாய்ப்பும் உள்ளது பல கடைகள் உள்ளன. ஒன்றிரண்டு இடங்களில் நடக்கும் பாதை இறங்கி வரும் பஸ் பாதையில் அமைந்து உள்ளதையும் காணலாம்.